When Ibsen’s A Doll’s House premiered in 1879, the door that Nora slammed behind her at the end of the play sent out shock waves. It’s not going to generate the controversy that it did then – not in our society anyway – but this finely tuned Sport for Jove Theatre Company production keeps you on the edge of your seat. As for the play’s relevance, you don’t need to look further than the all-too-regular news stories about men threatening, even killing wives and children, as a result of ugly separations to know that many women still find themselves trapped by men, circumstances and lack of money. Director Adam Cook takes a traditional approach with a period production that is faithful to Ibsen. It’s clearly been staged on a relatively tight budget but it is so beautifully paced and performed that it reverberates with a clarity and truthfulness that is utterly absorbing. Hugh O’Connor’s simple set features a plain back wall, inset with three doors, which becomes slightly translucent under certain lighting (Gavan Swift) so that we glimpse the comings and goings of the characters. Carefully chosen pieces of furniture suggest the period, along with O’Connor’s costuming. Matilda Ridgway’s lovely performance as Nora is at the heart and soul of the production. Initially she is giddily girlish as she plays at being the doll-like wife and little songbird her husband Torvald so frequently refers to. But as reality intervenes in way Torvald would never have thought possible, and the bars of her gilded cage seem to close ever tighter around her, a different Nora begins to emerge. Her final stance is deeply moving. Ridgway’s face is wonderfully expressive as emotion after emotion chases across it. She behaves in a slightly different way to each of the other characters – Torvald, her old friend Kristine Linde, who has fallen on hard times and arrives out of the blue hoping to find work now that Torvald has been promoted to head of the bank, family friend Dr Rank who has long been in love with Nora and is now facing death, the housemaid Helen who has effectively brought Nora up, and her young children. And then there’s Nils Krogstad from whom Nora borrowed money to fund a year in Italy that saved Torvald’s life. Not only does Torvald not know where the money came from but Nora forged her father’s signature on the contract. Since then she has been struggling to pay the loan back without Torvald knowing. Now Torvald has decided to sack Krogstad from the bank and give his job to Kristine. Douglas Hansell is excellent as the morally upright, pompous Torvald, who is misogynistic and domineering without ever realising that he is being anything but the perfect husband. Some of his comments about his wife’s role in life (namely to look after him and their children) triggered gasps from the audience, but Hansell plays it without becoming a one-dimensional villain. His love seems genuine even if he has no idea who his wife really is beneath the identity he has created for her. Francesca Savige is quietly contained as Kristine who believes Nora needs to grow up and take responsibility for what she has done, Anthony Gooley is suitably creepy as Krogstad, while gradually revealing the troubled man beneath, Barry French is warmly genial as Dr Rank and Annie Byron touching as Helen. Thom and Bill Blake are cute, cheeky, confident and convincing as Nora’s young sons (roles they share with fellow ATYP students Massimo Di Napoli and Noah Sturzaker). From start to finish, the production keeps you riveted. At the performance I saw, a young woman behind us, who presumably didn’t know the play, was almost hysterical with excitement at the ending, which had clearly taken her by surprise and knocked her for six. Thrilling. 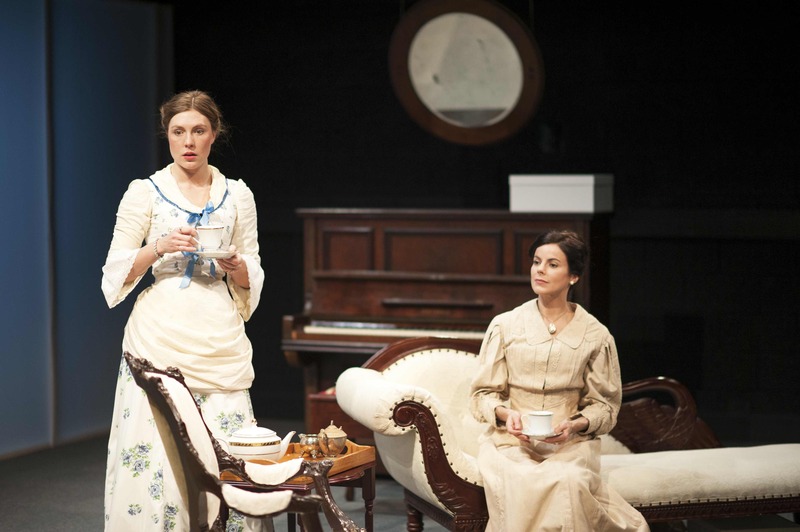 A Doll’s House is at the Seymour Centre until August 2.